Riding a bicycle is a real pleasure on the Swedish rural county side. With almost no traffic will you beholding the beautiful scenery along the local gravel roads trough forests-, lakes- and cattle grounds. 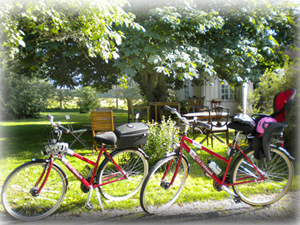 This bicycle tour brings you from Edens Garden to among Sätra Brunn and the picturesque village of Fläckebo. The village of Sätra Brunn is known for its ‘healing water’ from its own source. During this bicycle tour you have all the time to make short stops and absorbing the scenery, the sounds and the fragrance. Cycling trough the area of Svartådalen (The Black River Valley) will ease your mind and body. Forget about time and join your lunch package at any time and place of your choice. We do recommend to spare a few bites, because there are lot’s of places you want to stand still. What can we say more about this bicycle tour. This tour should you experience by your self, maybe you will find your own source? Bicycle with aluminium frame and 7 gears, safety helmet, route map with point of interests, picnic basket with fruit, drinks, tatsy organic and local produced products.